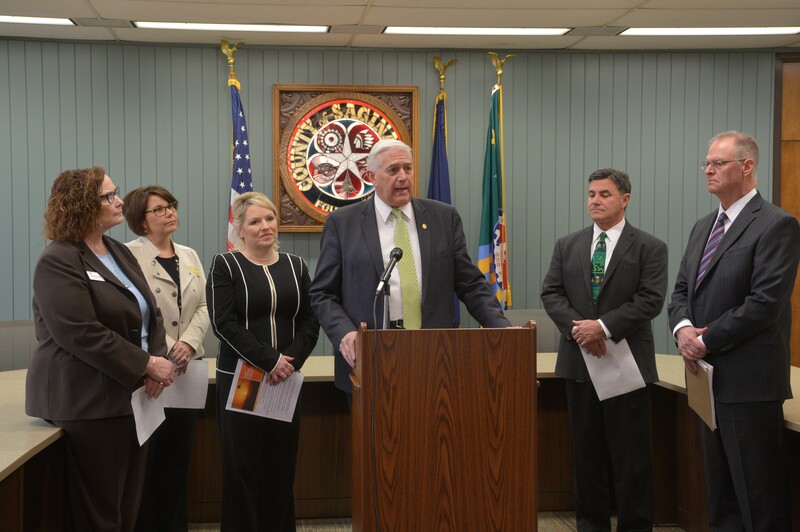 LANSING, Mich. — State Sen. Ken Horn, R-Frankenmuth, joined Sen. Margaret O’Brien, R- Portage, and Saginaw-area leaders on Monday to discuss the recently introduced package of bills aimed at combatting sexual assault. Senate Bills 871-880 would update and expand numerous existing laws and also create new protections in statute. 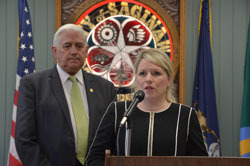 The bills would update current law to allow prosecutors to bring charges of second-degree criminal sexual conduct (CSC) against a minor at any time after the act occurs, while also allowing charges of third-degree CSC against a minor up to the survivor’s 48th birthday, or within 30 years of an accuser being identified by DNA evidence. 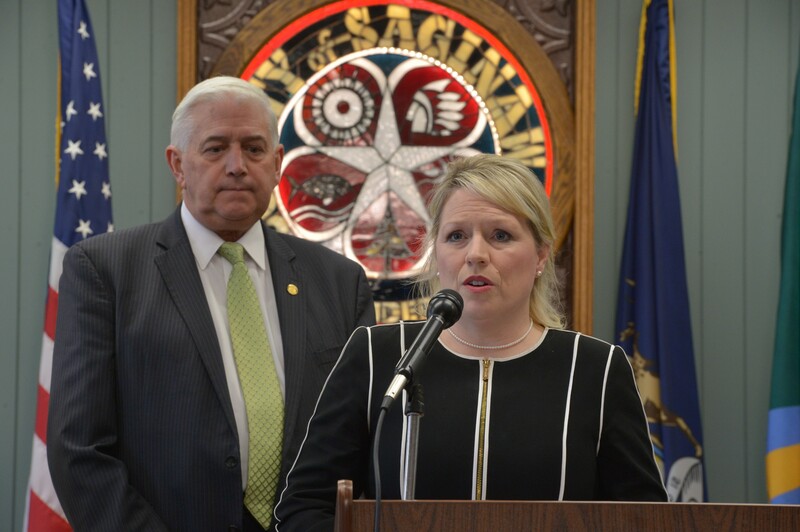 The bills would also allow victims of childhood sexual abuse to remain publicly anonymous when bringing a claim in the Michigan Court of Claims and eliminate the current time limit for filing a claim. Editor’s note: Print-quality versions of the above photographs are available by clicking on the images or by visiting the senator’s website at www.SenatorKenHorn.com. Click on “Photowire” under the Media Center tab. 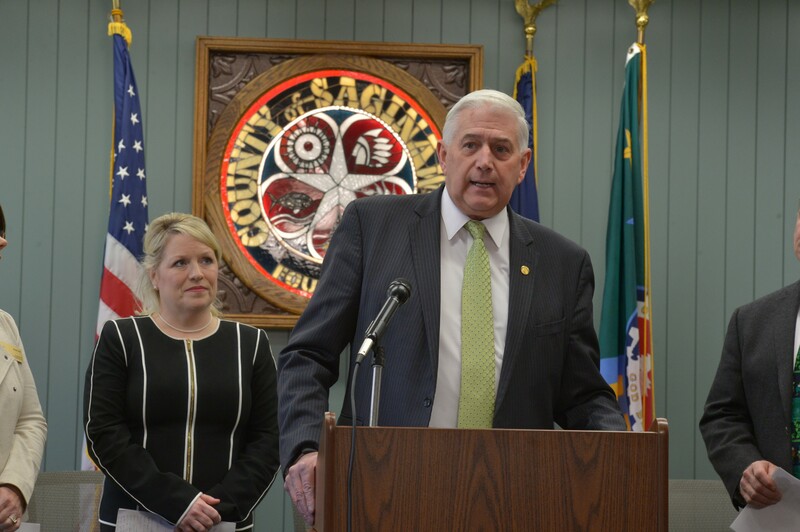 Photo caption one: State Sen. Ken Horn, R-Frankenmuth, stands at the podium with Sen. Margaret O’Brien, R-Portage, as she discusses SBs 871-880 at Monday’s press conference in Saginaw. 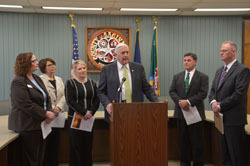 Photo caption two: State Sen. Ken Horn, R-Frankenmuth, stands with Sen. Margaret O’Brien, R- Portage; Judge Patrick McGraw; CAN Council President Suzanne Greenberg; Margaret Bach of Child and Family Services; and Mark Gaertner of the Saginaw County Prosecutor’s office as they discuss important updates to the state’s sexual assault laws. 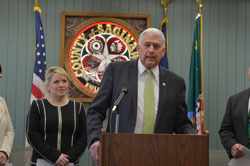 Photo caption three: Sen. Ken Horn, R-Frankenmuth, discusses Senate Bills 871-880 at Monday’s press conference in Saginaw.